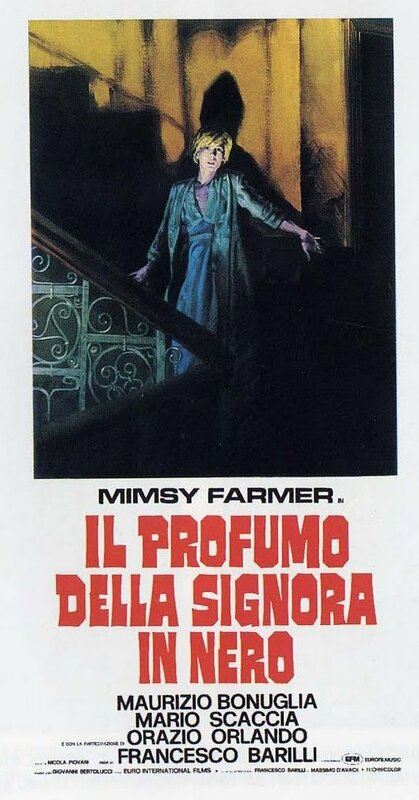 PERFUME OF THE LADY IN BLACK: Mimsy Farmer’s Aria Of Psychological Decay – Schlockmania! Some cult film subgenres are like their own private worlds, operating on a set of rules that don’t apply to the average narrative film. The giallo is one of the best examples of this kind of subgenre. The term refers to an Italian style of mystery/thriller filmmaking that features serpentine plotting, a string of often bizarre murders and a strong element of bizarre psychology. The giallo frequently bypasses rules of structure, plotting and narrative sense to create its own elastic style of cine-reality. Perfume Of The Lady In Black is a particularly fascinating example of the giallo style – and doubly unique because it bends the giallo rules to create its own distinctive variation of the subgenre. The story revolves around Silvia (Mimsy Farmer), a chemist who seems to lead a decent life in Italy. She is in a position of authority, is romantically involved and lives a comfortable lifestyle. Everything seems idyllic for her until she attends a social gathering where an African friend of her boyfriend’s speaks ominously about witchcraft and madness in his homeland. And that is where Silvia’s life takes a turn towards the bizarre. Memories of a repressed childhood trauma start bubbling to the surface, intruding on her day-to-day reality. She hallucinates about the title figure and a little girl that may represent what Sylvia was like as a child. She begins to see strange or ominous intent in the actions of all around her (and in a clever step, the audience is allowed to see similar events that she can’t see – thus drawing us further into her growing paranoia). Her grasp on reality/fantasy and past/present spirals out of control as people around her begin to die, leading her to take desperate measures that culminate in a genuinely surprising shock ending. The end result is both a giallo and a subversion of this subgenre all at once. It’s got several key elements – a fetishistic sense of visual design and color, a hypnotic musical score, a few brutal murders and an unnerving tone of dark psychology. However, it also differs from the usual giallo in some key ways. The killings are delayed until late in the film and the mystery element ends up taking a backseat to the exploration of Silvia’s crumbling psyche. The expected flashbacks to a past trau ma are present but are mainly used to illustrate the inner turmoil that the heroine suppresses instead of advancing the main plot. That said, Perfume Of The Lady In Black is no less a horror film despite these deviations from the expected trappings of the giallo. Co-writer/director Francesco Barilli does a beautiful job of infusing the gorgeous visual elements with a foreboding mood and directs the work of his collaborators toward these ends: Mario Masini’s lush cinematography handles sunlight and shadow with equal aplomb and Nicola Piovani contributes a lush yet creepy musical score build a musical-box motif that gets under the viewer’s skin. Barilli also deserves praise for the clever script he penned with Massimo D’Avak, which juggles a number of elements to keep the viewer off-balance until the film pays off in a devastating way at its finale. However, the element that really drives home the overall effect of Perfume Of The Lady In Black is Farmer’s performance as its troubled heroine. She was a regular in Italian genre fare during the 1970’s and in films like Autopsy and Four Flies On Grey Velvet she showed a unique skill for creating characters driven by a slow-burning style of insanity. She gets her best-ever opportunity to flex those skills here and digs into the characterization with the intensity of an opera singer. The resulting performance is one of the great slowly-going-mad characters in Eurocult history. Her ability to hit and sustain a mood of psychological anguish is impressive and plays a key role in the film’s overall unnerving effect. In short, Perfume Of The Lady In Black is a peak example of 1970’s Italian horror and deserves special notice for being one of a small handful of giallo films that innovate upon this dreamlike subgenre. If you’re into Eurocult stuff, it is a must.